In my previous entry, for which this follow-up entry is long overdue, I cited government intervention in free markets in the form of war, sanctions, imperialism, and mercantilistic policies as a primary cause for our current woes at the pump. 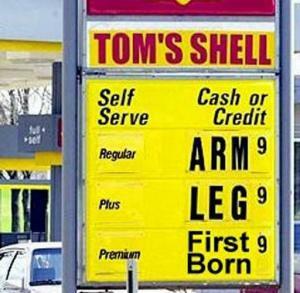 Today, I’d like to address the other primary cause: How inflation affects gasoline prices. As a first step, it is important that we do not improperly associate the word inflation with rising prices. In today’s terminology, it is commonly accepted that inflation is a rise in prices. This is incorrect. Rising prices are the result of inflation. Inflation is an increase in the money supply. This conflation of terms is intentional, as the government and its unconstitutional central bank, the Federal Reserve, seek to shift blame from their wealth-extracting policy of inflation to the marketplace. When the money supply is increased, it devalues the currency as more dollars are competing for the supply of goods available in exchange. To understand why the government inflates the money supply, I’d recommend a reading of my entries titled What is Money? and Fiat Money. When the government inflates the money supply, it issues new bills of credit to finance its operations. This is debt. This newly created money is then funneled to politically connected special interests, such as the Military Industrial Complex, and is used to fund government intervention to support corporatism, for example, supporting “Big Oil” through the manipulation of foreign governments in oil producing countries and subsidization of military dictatorships that will bow to the empire. When a fiat money is accepted in world markets as a standard and reliable currency, other nations are willing to accept that money in exchange for their goods and services. They are not acquiring real wealth, such as they would if they were exchanging their oil for gold; they are accepting debt paper. This ability to exchange debt instruments for real goods is known as exporting inflation. Foreign governments are now holding US debt in exchange for oil. This chart is the key (click on it or; source: inflationdata.com): It shows how the US government has successfully exported inflation since 1981 to drive down the cost of gasoline at the pump. Oil producing countries accepted more debt and provided oil in exchange, artificially reducing the cost of their product for two decades. Americans enjoyed cheap gasoline over this time period, as is reflected in our usage habits: We shifted from vehicles of high fuel economy to large SUVs and bigger cars because gasoline was inexpensive, but we were doing it with a national credit card. The chickens have come home to roost, as the saying goes, and now it’s time to pay for it. At some point, this privilege of being able to print money in exchange for real goods is bound to fail. The rest of the world is only willing to take on so much debt, and when they see their largest debtor running up a bigger balance and financing its operations with exponential deficits year in and year out, they begin to shift their desire to accept more paper. We can see this in the world oil markets, where many of the oil producing countries are no longer pricing their product in dollars, but have instead shifted to pricing in euros (another fiat currency produced by the European Union.) As of today, it will cost you $1.59 to buy one Euro. This exporting of inflation led to a shift in markets that would not have occurred had we been paying for oil with real money (gold) all of this time. Consumer preferences for large, fuel-thirsty vehicles may have never come about, or perhaps demand for more fuel-efficient vehicles (both larger and smaller) may have created innovation in fuel economy. Central banking creates booms and busts. What we are witnessing here is a gasoline boom, followed by the inevitable bust. Don’t be angry at oil companies, they are only taking advantage of what your government has bestowed upon them. The government and its central bank are to blame.